SODA SPRINGS, IDAHO: A lightning caused fire twenty-four miles northeast of Soda Springs, ID has burned approximately 1 ½ acres and is located two miles north of Diamond Peak. 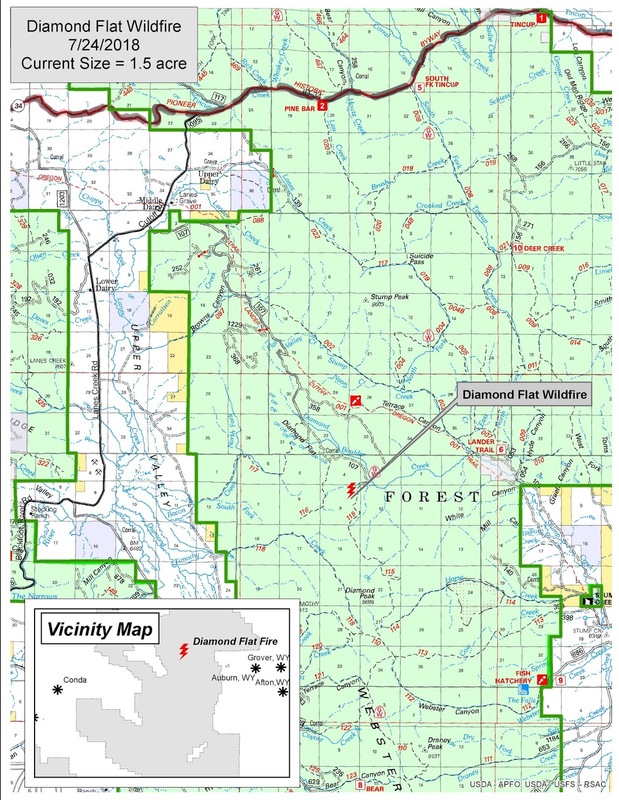 The Diamond Flat Fire started on July 18th and is burning primarily in sub-alpine fir, lodgepole pine and mixed brush understory. The current fire behavior is smoldering, creeping and group tree torching. General spread is to the southwest. The primary objective of the Diamond Flat fire is forest regeneration. By allowing fire to take its natural role in the ecosystem, increased plant diversity and aspen regeneration as well as improved critical big game habitat can occur. Smoke from this fire is visible from State Highway 89 between Auburn and Afton. As well as from Diamond Flat Road (Forest Service Road 107). Smoke is expected to be visible throughout the summer months. This fire is being actively managed by local fire personnel.